« Green Curry: I am just not that into you. For the past few months, I have been eating lunch Monday–Friday at the school where I teach kindergarten. The food started off mediocre and has gotten progressively worse throughout the semester. I told myself that I would only eat out once a week, in an attempt to save money. However, for someone who loves food as much as I do, having four awful meals a week just wasn’t working out. Thankfully, I discovered a som tam lady. 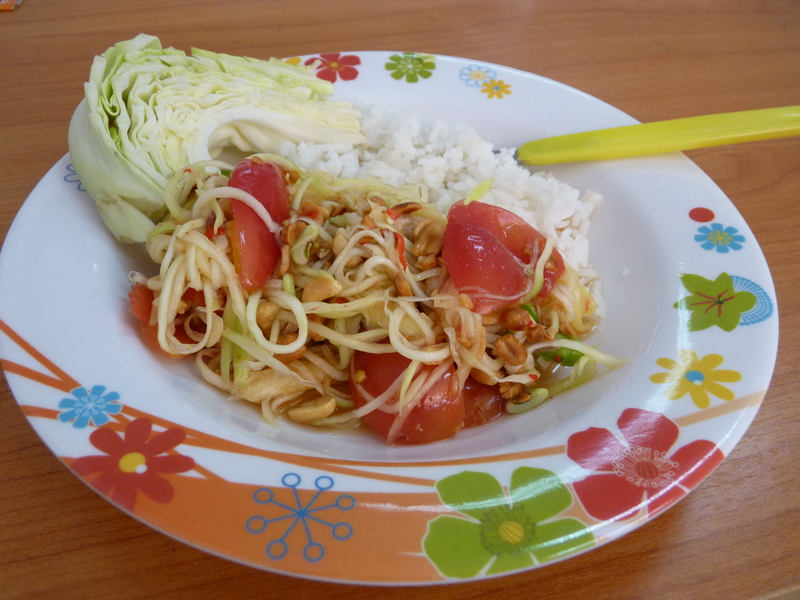 I have had som tam many times in Thailand so it would be more accurate to say I discovered my latest som tam lady. While taking a short motorbike drive to grab a diet coke from the local convenience store, I spotted her. The piles of shredded papaya and limes were a dead give away. Som tam is a classic spicy Thai salad. Unlike most western dishes, som tam’s flavors are multi-dimensional; sweet, sour, spicy and salty. The dish is made by pulverizing the ingredients with a mortar and pestle. The process begins with a handful of small Thai garlic and fresh red chilies (I have to ask for, “neung prik kha”, one pepper please). Then comes the sauce: a mixture of fish sauce, palm sugar, freshly squeezed limejuice, and salt. A large handful of shredded papaya, plum tomatoes, green long beans and peanuts mak mak (lots) are added to the mortar to finish the dish. The concoction is tossed in the sauce and served alongside sticky rice. Som tam is a great alternative when I get to the point where I just can’t eat another rice dish. Needless to say, my som tam lady is a lifesaver, or at least my lunch saver. By now she knows to leave out the fermented shrimp and raw crab and gives me extra peanuts to compensate. Already, I have had som tam for lunch four times this week (and it is Thursday). Can you guess what my lunch will be tomorrow? Som tam is SOOOO amazing! It’s even quite delicious here, though I have yet to venture to make it. I’m a bit afraid of the “green” part of the Papaya, making sure that it’s the correct non-ripeness. Anyway, I’m sitting at work with snow everywhere and just dying to have some real Thai street food! I’m so glad I found your blog! I look forward to exploring more of it! I’m learning a lot from your blog even though you’re just another blonde backpacker in Thailand. I worked at Thai Image, now Yummy Bowl in Highland Park, IL (as a delivery drive). Yummy Bowl has really changed the menu and gone downhill. Back in the day though, they’d let me man the wok now and then and make my own treats. Haven’t been to Mt Everest, but may check it out. The green curry at Cozy Noodle is atrocious, but I recommend trying the green curry at Panag, in Chicago at Chicago/Clark, or Pacific Rim/Oysy in Northbrook btw Dunee and Lake Cook on Skokie Blvd. Panang is owned by the then head chef of Thai Image, before they sold. Have fun, looking forward to more of your entries. can’t believe i never tried this! 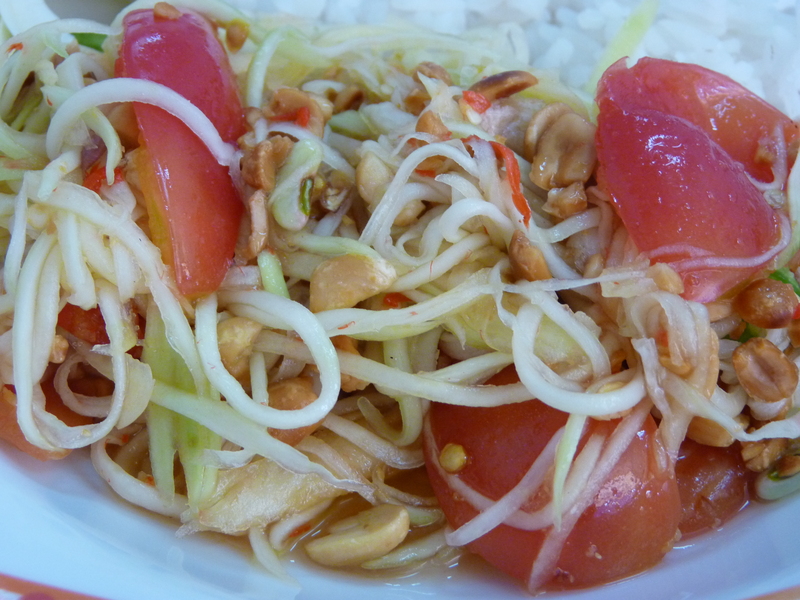 Papaya salad is my favorite food! I’m gonna have to remember to ask for it ” neung prik kha” when I go over there. Thanks for le’ tip!